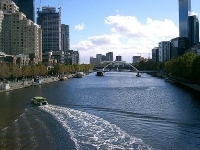 A visit to Melbourne would not be complete without a good look at its main river system, the Yarra River. Often the subject of jokes due to its brownish colour, it is actually not dirty, just muddy. The Yarra has become the focus of much development in the central business district, with many new buildings, walks and parks having been created along its banks in recent years, including the relatively new Riverside Park. For the best view of the Yarra River walk to Princes Bridge, St Kilda Road, or take a cruise along the river from Princes Walk (below Princes Bridge). Otherwise, simply enjoy a stroll or a picnic on the riverbank in one of the public parks.